PJM Interconnection is a regional transmission organization (RTO) that coordinates the movement of wholesale electricity in all or parts of 13 states and the District of Columbia. My colleage, Troutman Sanders attorney Peter Glaser, just sent around a memo on the impacts of EPA’s regulatory surge on electricity prices. The memo is based on PJM auction reports (here and here). 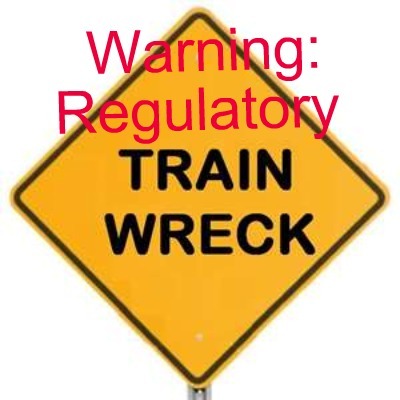 Reality has interceded in EPA’s attempt to play down the impact of its train wreck regulations on the electric utility industry. First came the widely reported news that Louisville Gas & Electric had filed for a 19% rate increase by 2016 to pay for the upgrades that the regulations will require. Now, we have the results of the capacity auction that PJM just conducted for the 2014-15 capacity year. The resulting capacity prices were about 4.5 to 8 times as high as prices paid in the last two auctions and 2.5 to 3 times as high as market analysts had predicted. According to PJM, most of this increase can be laid at the feet of EPA. Based on PJM information, we calculate that the portion of the increase attributable to EPA will cost load (customers) in the PJM region $2-3 billion just in capacity costs and just for a one-year period (2014-15). The PJM Interconnection is a FERC-approved regional transmission organization that manages the high-voltage electric grid and the wholesale electricity market that serves 13 states and the District of Columbia. In PJM, the “Reliability Pricing Model” (or “RPM”) is a forward auction of electric generating capacity that occurs annually, three years ahead of the year for which capacity is procured. PJM procures enough capacity to cover the anticipated demand for electricity in the region plus a reserve margin. Generating units bid into the RPM auction based on their anticipated costs. Every generating unit that clears the auction receives a capacity payment based on the market-clearing price, which is set by the marginal (i.e. most expensive) unit. PJM then assesses the costs for those capacity payments on load (customers) in the PJM region. These capacity payments are in addition to payments that generators receive for the energy they sell from their generation. On March 16, 2011, the U.S. Environmental Protection Agency (EPA) issued a notice of proposed rulemaking in a proceeding to promulgate final maximum achievable control technology (MACT) emissions standards for hazardous air pollutants (HAP) from coal‐ and oil‐fired electric utility steam generating units, pursuant to section 12(d) of the Clean Air Act. A final rule is due by November 16, 2011. Compliance from existing resources would be required approximately three years later, likely in early 2015, which implicates the 2014/2015 Delivery Year. Compliance with increasingly stringent environmental regulations requires generation resources to install emission mitigation technology which increases the avoided cost offers of these resources. These increased costs were a significant contributor to the increase in clearing prices in the western part of the PJM RTO. The increasingly stringent environmental regulations had a two-fold impact on western PJM clearing prices: (1) generation resources affected by the increasingly stringent rules, the majority of which are located in the western part of the PJM RTO, could include the cost of investment needed to comply with the new regulations in their cost-based offer price and (2) the amount of offered MWs from generation resources decreased because the resource owners decided the resources were not viable to comply with future regulations and therefore will deactivate as opposed to installing equipment to comply with the new rules. • The May 2011 auction cleared over 142,000 MW of capacity for the unconstrained areas of PJM. • The System Marginal Price (the basis for the market clearing price) was over $125 per MW/day. • This represents an increase of over $97 dollars per MW/day over the clearing price from the last annual auction and a $75 increase from the price expected by Barclay’s. • PJM concluded that “60 to 80%” of the increase in generators bid costs in the May 2011 auction was due to environmental regulations. • Even if one assumes that the market price would have cleared at higher levels than the last auction (e.g. the $50 price expected by Barclay’s), the proposed EPA Regulations just caused an increase in electric capacity prices of approximately $2-3 Billion for a one year period, in the PJM region alone. an abject failure. Politicians made the grevious mistake of annoiting this shady hypothesis (AGW) with the mantle of political correctness. Real science is just beginning to be recognized as correct by the general public. The media seem to be the last to recognize they bet the farm on sensatiionalizm. I am beginnning to hope that our world governments will finally realize that controlling climates is too big for humanity. Certainly the EPA rules had some impact on the auction, but there are 2 other large changes that caused the increase in the clearing price for the PJM RTO. The combination of the other changes in the 2014/15 auction make it difficult to measure the true impact of the EPA regulations. First, in the last 2 auctions, the MAAC region (the eastern part of PJM) was constrained. So, for the 2013/14 delivery period, even though RTO clearing price was low ($27.73 /MW-day), the MAAC clearing price was very high ($226.15 /MW-day). For the 2014/15 delivery year, RTO cleared at $125.99 /MW-day, but since MAAC was un-constrained it only cleared at $136.50 MW-day. Due to the auction dynamics, when the east becomes less constrained, its price will decrease and the west price will increase. If you compare the weighted average clearing price across all of PJM, for the 2013/14 delivery year the capacity price is about $123 /MW-day and for 2014/15 the price is about $133 /MW-day. So, across the entire PJM system, the increase wasn’t really from $27.73 to $125.99, even though that is the change in the RTO price. Second, the increase in the generator’s offer price was not solely due to the new EPA regulations. Based on the PJM tariff, generator offer prices are capped based on their fixed costs required to continue operations for one year minus the average revenues they made in the last three years of operations. This basically means that if a generator can pay its bills using money from the energy market, it will be forced to bid into the capacity market at $0. However, if a generator is not making enough money in the energy market, it can bid higher. If that higher bid clears in the capacity market, it is a price signal to the generator that it is needed for reliability, and it will receive the additional money needed from the capacity market. The 2013/14 capacity auction used revenues from 2007, 2008 & 2009 for this offer cap calculation, whereas the 2014/15 auction was using 2008, 2009 & 2010 for this calculation. Dropping off 2007, when energy prices were high, and replacing it with 2010, when energy prices were low, allowed generators that were forced to bid in at $0 in the 2013/14 auction to bid in higher in the 2014/15 auction. How much higher is impossible to measure, and depends on each generator’s economics. Also, I would like to note that the $126 clearing price is not as anomalous as it seems when you look further back in history. The RTO clearing prices have been as high as $174 /MW-day and it may be more accurate to say the low clearing prices were anomalous. Finally, the last bullet in the article above states ‘Analysts have concluded that these prices are not “likely [to] decline meaningfully anytime soon, and thus, we expect the clearing price levels to remain relatively elevated (versus the 2013/2014 auction) for the foreseeable future.”’ Are these the same analysts who predicted the auction would clear at $40? I have read many of those analyst reports, aside from all being wrong in predicting the auction clearing price, they had one other thing in common: They all included, or said they included, the impact of the EPA regulations, however, none of them included the 2 changes I have cited above. There are no surprises here, only that this totally unnecessary expense is allowed to happen due to the supreme ignorance and greed of our politicians.This will go down as the fleecing of middle class America over a badly flawed hypothesis (AGW). There has been over $30 billion expended in Gov’t research grants trying to prove that dangerous global warming will result from man’s increasing use of fossil fuels since the Industrial Revolution began 150 years ago. We have been in a normal warming trend since the Little Ice Age bottomed out aroound 1300 AD. Warming maxed around 1940, slight cooling to 1970, slight warming to 2000, none since. Egregious lying claiming unprecented warming is totally unprovable, but this myth has a life of its own due no doubt to the huge investment in the concept. In truth, with ice in our polar regions and several degrees lower global temperatures, I maintain we are still in a glacial mode and much more likely to lapse into Pleistocene Ice Age No. 6 because our weak Sun is dependant on a vigorous greenhouse gas to prevent another snowball Earth event (twice in the distant geologic past ice to the equator). Please, please humanity, do not try to eliminate GHG.